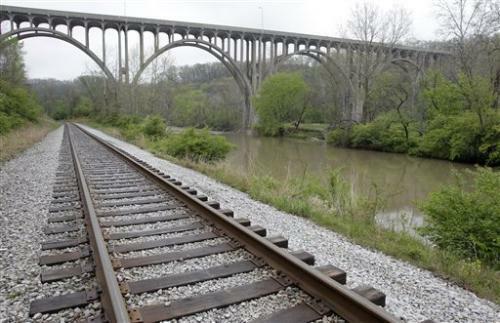 Five anarchists have been arrested and are being accused of plotting to blow up Cleveland Bridge to protest corporate America and the U.S. government. Are people really fed up with the U.S government ? U.S was doing so much to stop terrorism that it forgot to care for it’s own people ? Self-proclaimed anarchists Douglas Wright, 26, Brandon Baxter, 20 and Anthony Hayne, 35, developed the plot over several months before targeting a bridge over the Cuyahoga Valley National Park on Monday night, according to a criminal complaint filed in federal court in Cleveland. Explosive devices provided to the suspects by an undercover FBI employee were inoperable to ensure there was no threat to the public, the complaint says. Two of the men are accused of placing two devices at the base of a concrete support pillar for the bridge on Monday night. The FBI said the pair tried to remotely detonate the devices from a safe distance. An FBI informant allegedly taped secret conversations with the suspects for months before the bombing effort, the complaint says. The suspects planned initially to try to set off an explosive on May Day, the complaint says. Baxter allegedly planned to join a May Day protest and “act as a decoy or diversion” to move the crowd and police away from the bridge, which would then be blown up. The complaint also quotes Wright and Baxter as saying they did not want people to think they were terrorists, so they were looking to blow up a bridge at night or to pretend to be a construction crew and stop traffic onto the bridge before the explosion in order to limit the number of casualties. Wright also allegedly said the group was trying to recruit new members at homeless shelters and neighborhoods on the east side of Cleveland. The complaint quotes Baxter as saying he thought that if the group got caught they would end up at the Guantanamo Bay detention facility. For some reason, this whole story seems wired and somewhat cooked up. What is the government trying do here ? Are we going to taken on another ride to implement some new laws that will control even our body movements ? just kidding, but seriously what do you guys think about this whole melodrama ? Justin Bieber Performs "Boyfriend" Live for First Time!